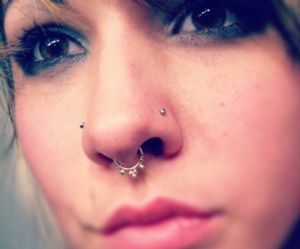 Although once less common than nose piercings, septum piercings are finally trending big time. With a long and culturally rich history in the world of body jewelry, and with such diverse possibilities available, it's time to give this piercing a shot in the limelight. Don't let the name confuse you - it's likely you've seen at least one or two people with theirs pierced today already. The septum is the area of skin between the nostrils. There's a small area between the cartilage and the bottom of the nose, which is where the piercing is made. Unlike nose or eyebrow piercings, this form of body jewellery doesn't have to be visible if you don't want it to be - meaning there shouldn't be big issues with wearing your piercing at work. It is definitely important to make sure a professional does this piercing for you! Although there are tribes in Neuguinea who do the piercing using a pointed end of the sweet potato plant, a professional piercer in a studio will have a sterilised single-use needle ready for your piercing. As this are of the nose isn't typically straight, the piercing should be done using a special clamp as this will ensure the needle has a quick, easy passage through the skin. Once you've got it done, try to make sure you only touch the pierced area with clean hands. Owing to the location, make sure that you treat the area carefully if you get a cold - in these cases, remember to disinfect your piercing regularly. Generally speaking, it should take around two to three months for your piercing to fully heal before you can change the body jewelry itself. This gives you plenty of time to consider your options! These piercings have a great history! Popular in many African cultures, as well as Indian and Native American peoples, you can see the culmination of cultures in the amount of options available for this type of body jewellery. With the customisation options too, you're definitely not limited to one look. For the initial piercing, a curved barbell is generally used. When it comes to considering what else you have available, the options are pretty much endless. Circular bar bells are incredibly popular, as well as captive bead bells, which can easily be customised, too. If you'd prefer something towards the discreet end of the market, septum retainers can be easily hidden. Although you can also easily hide a circular bar bell by pushing it back into the nose, some wearers do find this a little uncomfortable. With stars such as Scarlet Johannsen and Jessica Biel boasting their piercings, you'll not be lost for inspiration!